Monday morning. I am about to go to the Hypergraphia window at 215 West 38th Street for a final three days of drawing from 11:30 AM - 1:00 PM. Early Thursday morning I head to Boston for the 2011Transcultural Exchange Conference. 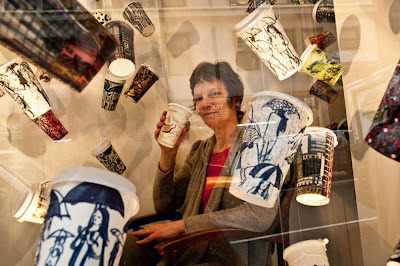 The cups will still be on view until 5:30 PM Friday, April 8th, but my chair will be empty. 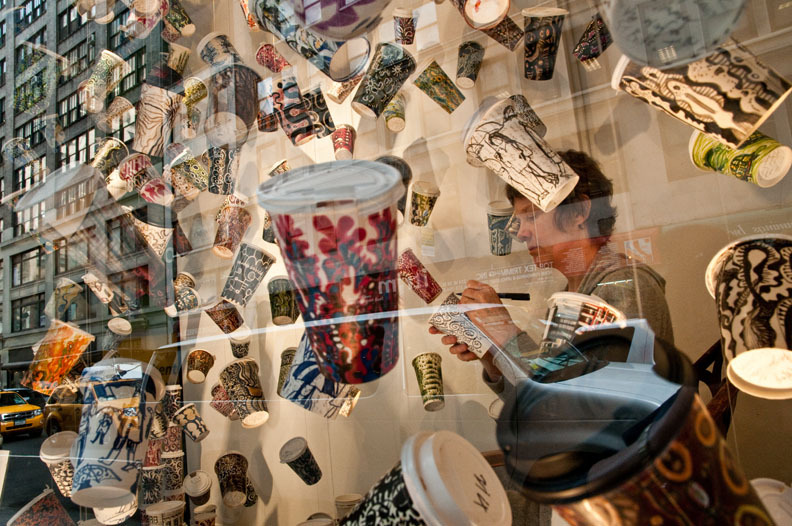 Cups drawn in the Hypergraphia window. I am sipping my morning tea and considering the last five weeks. 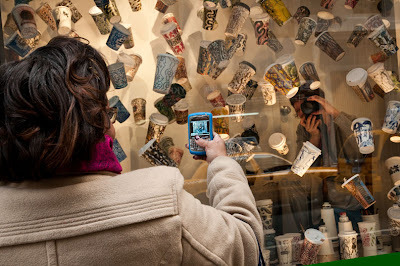 One of the most frequently asked questions has been "did you drink all that coffee yourself?" Well, I drank from all the cups, but the truth is most of it was decaf. I love my morning cup of strong Scottish tea, and another cup in the afternoon. Otherwise, it is Barry's decaf tea or Celestial Seasonings herbal teas. When it comes to coffee, a decaf latte from a high end bistro at any time of day does the trick. If I deviate, I feel it in my hands and see it in my drawings. Where does the city stop and the cups begin? Another question has been "how has it changed your artwork? "I had to think about that. The drawings did change considerably during my weeks in the window. At first, I could only draw and paint spiral patterns. 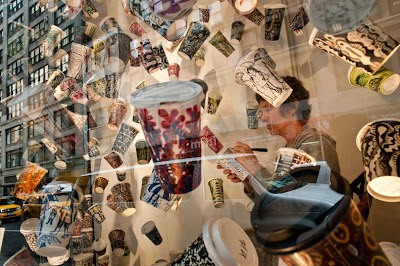 I felt like I was at the center of a maelstrom of coffee cups, people, traffic, and bright lights. Then, conversations with my art dealer Cheryl McGinnis and with visitors crept onto the cups. A daily salon shaped up in the shop space behind the window and I joined in through the door. 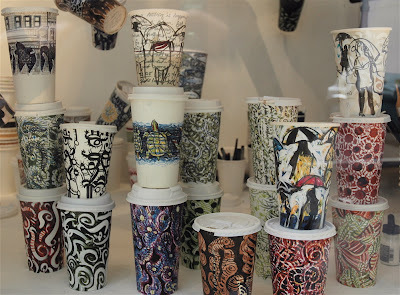 A discussion about handwriting led to a set of calligraphic cups. After a conversation about pets, I covered a cup with greyhounds. Then a set of turtles appeared, climbing on each others' backs, as they do in the turtle tank in the window of Lucoral, a gem store down 38th. Eventually, my focus shifted out to the sidewalk and a whole week of rain led to a parade of drawings of people carrying umbrellas. Simple and gestural, these were very satisfying to do and connected me to the way it feels to draw while traveling. The greatest achievement is to retain the eyes of the traveler while in your own back yard! 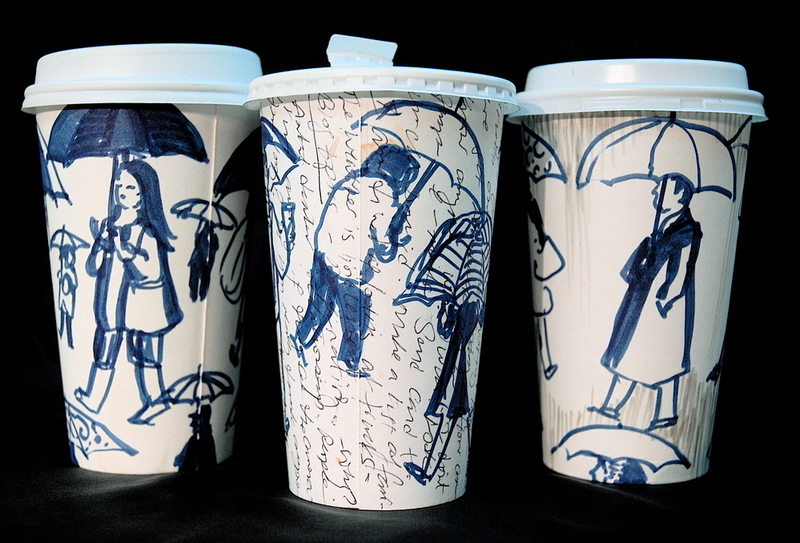 Coffee break, surrounded by umbrella cups drawn in the window. Was I performing in the window? No, I was just drawing and using the window space as my art studio for the run of the exhibition. Unlike performance artists who explore the limits of human endurance, my self-assigned task was to be as comfortable and productive as possible. I therefore felt free to engage with viewers through the plate glass window, or not, as the depth of my concentration dictated. Ultimately, the window has been a haven - a protective bubble of glass surrounded by the weather and the ever changing, ever fascinating streetscape. Social, inspiring and surprisingly peaceful, I can't believe how much drawing I have done. Now I have a question of my own; how will I go back to making art all by myself? on social media platforms, spreading the word. Hope they were all flattering! i only now discovered your blog and i am absolutely fascinated by the art you create on paper cups. amazing work! 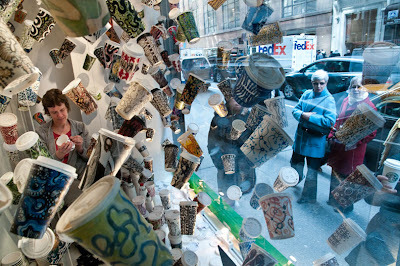 I love seeing all of these cups/drawings suspended! How creative! I love, love, love the idea!!! Keep up the good work!